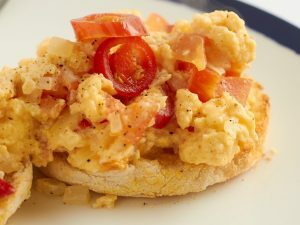 One of the biggest breakfast joys is sitting down to a plate of beautifully scrambled eggs with toast, don’t you agree? 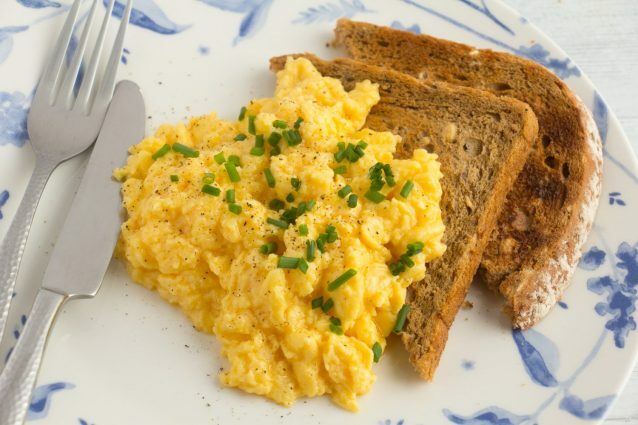 Scrambled eggs may seem very easy, but as many people have found out, it’s not just a case of whisking up eggs and dumping them in a pan! 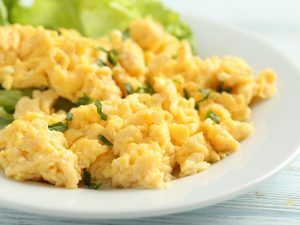 Overcooked, rubbery, watery scrambled eggs are surely no-one’s favorite, but overcooking eggs is unfortunately easy to do. The key for creamy, fluffy eggs is to use heat low and slowly, and to watch the eggs all the time. Once you’ve mastered this technique, why not switch things up at breakfast time by adding some sausage, mushrooms, leftover veggies, bacon or any other food you can think would pair well with scrambled eggs. 1. Melt butter in a small saucepan over medium heat. 2. Crack two or three eggs into a mixing bowl. 3. Add milk and salt. Aggressively whisk the mixture until it is uniform in color, texture, and slightly foamy. You want the whites and yolks fully combined. 4. Add the eggs to hot pan and immediately reduce the heat to low. Use a rubber or wooden spatula to push the eggs from one end of the pan to the other. 5. Continue doing this, gently and slowly, always pushing the cooked eggs from the bottom of the skillet and allowing the uncooked egg to take its place. When the eggs are mostly cooked, but look fairly wet with what looks like thick liquid egg around the curds, slowly fold the egg mixture into itself one or two times. Add any cheese, meat or vegetables at this time. 6. Remove eggs from pan when the eggs are set but still soft and moist, and transfer to a plate. Finish with freshly cracked pepper. Garnish with fresh herbs, if using, and serve with toast if desired. *If you add any extra ingredients, make sure they are already fully cooked before adding them to the egg mixture. Once the eggs are done, serve straight away. If you leave them in the pan even for a couple of minutes they will continue to cook in the residual heat and turn rubbery.